The building on the right is Canada Hall. My son Martin had a joint 17th birthday party here with his friend Steph. It was Martin's last birthday, as he died of primary bone cancer a few months later on 6 April 2007. It was such a wonderful night. I will always treasure the memories which return every time I visit Canada Hall. In mid 1940 a corps of the Royal Canadian Engineers and the 9th Field Ambulance, Royal Canadian Army Medical Corps (RCAMC) took over Merstham House, parts of Church Hill and was also billeted in nissen huts at Pendell Camp, Warwick Wold. By December of 1941 a total of nine bombs had fallen on Merstham mainly in the Church Hill and Shepherds Hill areas. Perhaps the most memorable event of the war, to the residents of Merstham, happened on the evening of Saturday 19th April 1941. During a raid that evening a German plane dropped two parachute mines over South Merstham. One dropped harmlessly on Wells Nursery, but the other exploded on All Saints Green. The explosion, heard for miles, had a devastating effect. All Saints Church was completely destroyed, as was the vicarage and two nearby houses. A total of ten people died in the blast that night. The 84-year-old vicar, who had been reading in his study, suffered severe injuries. One of his two sisters was killed and the other, like the vicar himself, was in hospital for several months. As in many other communities all over Britain, Merstham showed its ‘British Bulldog’ spirit and life returned to some semblance of normality fairly quickly. War conditions being what they were, applications by the All Saints congregation to build a ‘church hut’ where they might worship were at first turned down by the authorities. The members of the church continued their services in Battlebridge Hall, half a mile away. Serving with the RCAMC was Corporal George Hedley Wolfendale, a priest of the Church of England who had enlisted at the outbreak of war. At the time of the disaster, and the resulting injuries to the vicar, he took over and saw that life and worship of the church continued. Late in 1941 George Wolfendale was appointed to the Canadian Chaplain Service in the honorary rank of captain. Thereafter he was attached to various units, chiefly of the Royal Canadian Engineers, and through most of 1943 he was with the 1st Canadian Corps Field Park Company RCE. 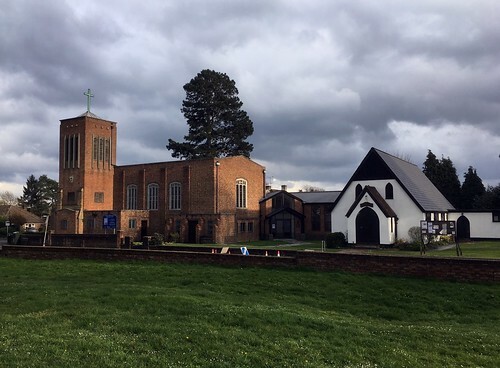 He would never forget the parishioners of South Merstham, and now his engineering connections enabled him to realise the dream of giving them a new church. The Chief engineer of the 1st Corps, brigadier J L Melville, approved the rebuilding project, and in March 1943 the work began under the watchful eye of Lieutenant Frederick Eaton. All the material used was salvaged from the wreckage of the destroyed church and vicarage. In five weeks the building was completed and on Easter Day 1943 the ‘new’ church, was dedicated for worship by the Bishop of Southwark. Worship continued there until the new All Saints Church was completed on 19th April 1950, exactly seven years later. The little church built by the Canadian sappers continues to exist as Canada Hall, named in memory of it’s origins and as a reminder to the fact that thousands of Canadian servicemen and women made their temporary homes in Surrey during the war years.